What were you doing in 2002? Were you at school, college or university? Or maybe you'd just started work. Me? I was, as I am now, living and working in London. I was just about hanging on to my twenties. I had more hair, and it was largely black. I'd like to say I was slimmer, but that would be a lie. Was I as obsessed about food as I am now? 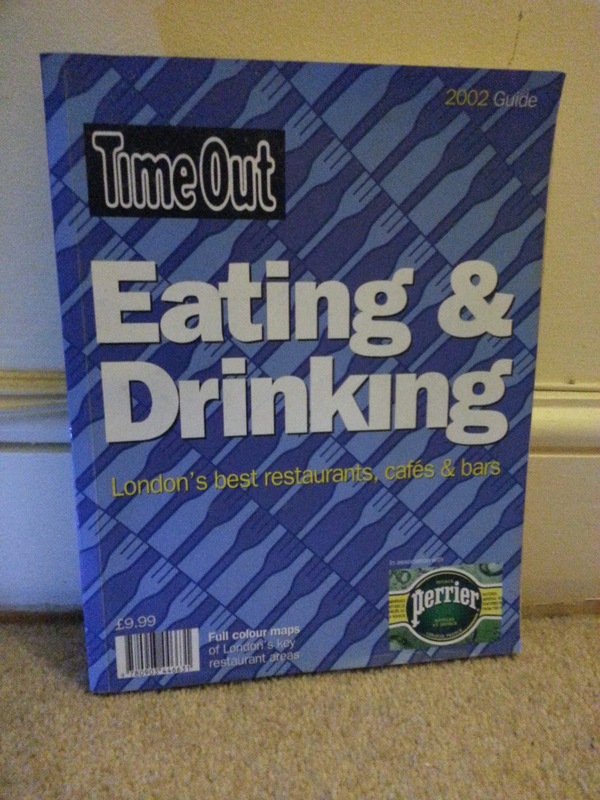 Probably not, but I did enjoy eating out to the extent that I was the proud owner of the 2002 Time Out Eating & Drinking Guide. I came across my copy when I was having a tidy up. Needless to say, this meant that I spent a good few hours flicking through it instead of clearing out crap in my flat. Browsing through the guide, I was particularly fascinated by the changes over the last decade or so in how we eat and what we eat in London's restaurants. Take burgers, for example; the options in 2002 would absolutely horrify the burgerati of today. Without irony, Hard Rock Café, Planet Hollywood and TGI Friday's all appear in the 2002 guide as do Ed's Easy Diner and the long-departed Tootsies. Back then, there was no Patty & Bun, no Byron and no spawn of Meatwagon. In fact the best in class was the original, and in those days, sole Gourmet Burger Kitchen (GBK) outlet on Northcote Road. In the words of Time Out: 'We're talking better than Eds, better than Hard Rock'. I was a big fan, and while GBK has since lost its lustre through over-expansion, it was a harbinger of better things to come. Whilst GBK might not be the godfather of the burger revolution that we have seen in the 21st century, it can certainly be considered a stepping-stone. It's not just the burger scene that has changed beyond all recognition; London's Chinese restaurant scene has evolved, too. Dim sum was just beginning to break out of its for-us-by-us-Chinatown-ghetto with the opening of Hakkasan in 2001. Other signs of this sea-change included the expansion of the Royal China mini-chain and the likes of Phoenix Palace opening up in not-particularly-Chineser parts of town such as Marylebone. Fast-forward to 2013, and there is little doubt that pretty much all of the capital's finest dim sum eateries are found outside of Chinatown. Going back to 2002, London's best Chinese restaurants were dominated by Hong Kong-style Cantonese joints serving up authentic dim sum, seafood and roast meats in parallel with a menu serving westernised dishes for the perceived tastes of the non-Chineser. While this style of restaurant still predominates today, there is so much more variety with many regions of China represented in the capital. In particular, as in China itself, Sichuan cuisine has emerged as the main challenger to the Cantonese hegemony. 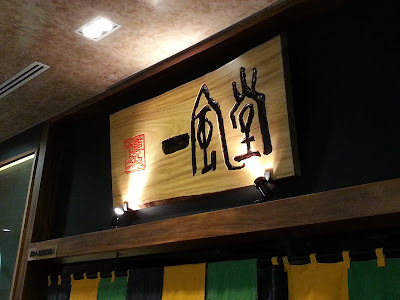 In turn, many Cantonese places now translate their menu in full to showcase their hitherto hidden delights. So, while not quite up to the standards seen in New York, Toronto or Sydney, there has been a big improvement in the quality and diversity of Chinese cuisine in London. If you thought the burger scene was a bit crap in 2002, it was positively buzzing compared to what passed as ramen in London. Then as now, Wagamama was the mainstream option, but there were very few specialist indie ramen shops. 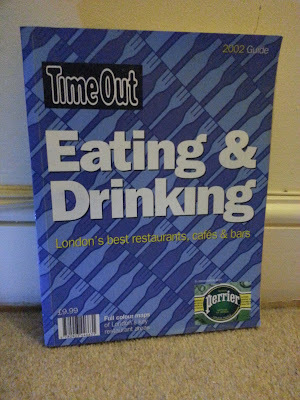 In fact, scouring the Time Out guide, the only joint that seemed to put ramen first in those days was Ramen Seto. I reviewed it in 2009; it was decent enough but compared to the new generation of ramen shops, it now seems all a bit old-fashioned. Every era has its culinary trends and places-to-be-seen-at. Looking back at the early-noughties, it would seem that I was more a dedicated follower of fashion than I am today. Atlantic Bar & Grill, Bank and numerous Terence Conran restaurants were all ticked off my list. And knowing what I now know, I am a tad horrified that I was a big fan of Smiths of Smithfield, which had a certain John Torode in charge of the kitchen. In my defence, he hadn't appeared on MasterChef at that point in time, and the cocktail bar was brilliant. Many of these places served up food, which fused Middle Eastern, South Asian and East Asian flavours into dishes served the European way. Sometimes this worked, other times it didn't. Plus ça change. And while the quality of the food was often variable, all of these places had a fantastic buzz. All of which makes me wonder if Balthazar's arrival on the London scene is at least a decade too late in that punters nowadays place as much emphasis, if not more, on the food than the atmosphere. The last decade or so has seen the rise and fall of a certain Gordon Ramsay. Back in 2002 he hadn't quite reached his commercial peak, but it could be argued that the restaurants in his stable were at their creative peak. In particular, Petrus, which in those days was an intimate restaurant in St James, operated by his then best mate, Marcus Wareing. I had the privilege of eating there around that time (I did tell you I was a restaurant whore back in the day) and it remains one of the best meals I've ever had. Original Petrus is a rare instance of when things were better back in the day (another one is Antonio Carluccio's Neal Street Restaurant – what the capital would give nowadays for a centrally located Italian restaurant of that quality) but on the whole, London's restaurant scene has just got better and better. Whether it's up there with the best in the world, well that's another question for another day. Over the last decade or so, Copenhagen has become one of the must-visit foodie destinations. With all due respect to the Danish capital, this would have been scarcely believable a generation ago. After all, Danish food isn't traditionally thought of as being one of the world's major cuisines, and nor is Copenhagen - unlike London - a metropolis that draws big name chefs from all four corners of the world. So just what is it that makes the restaurant scene in Copenhagen so exciting? If I was being facetious I would say that it's as simple as giving my restaurant a trendy one-word name like Noma, Radio or Geist; staffing it with bright young things in check shirts and aprons; getting some stylish interior designers in and using some weeds found growing by the side of the road as garnish. If only if it was simple as that. The thing is when it comes to style over substance, you'll get found out sooner or later. No, there has to be something more to it. 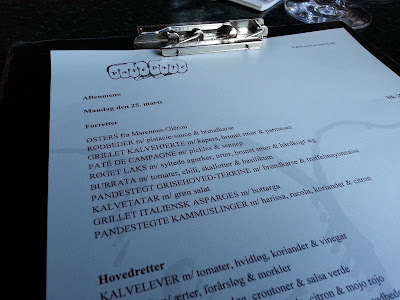 For me, it's the 'anything goes' mentality that brings different ingredients together in a fresh, imaginative and visually arresting manner that makes eating in Copenhagen so exciting. 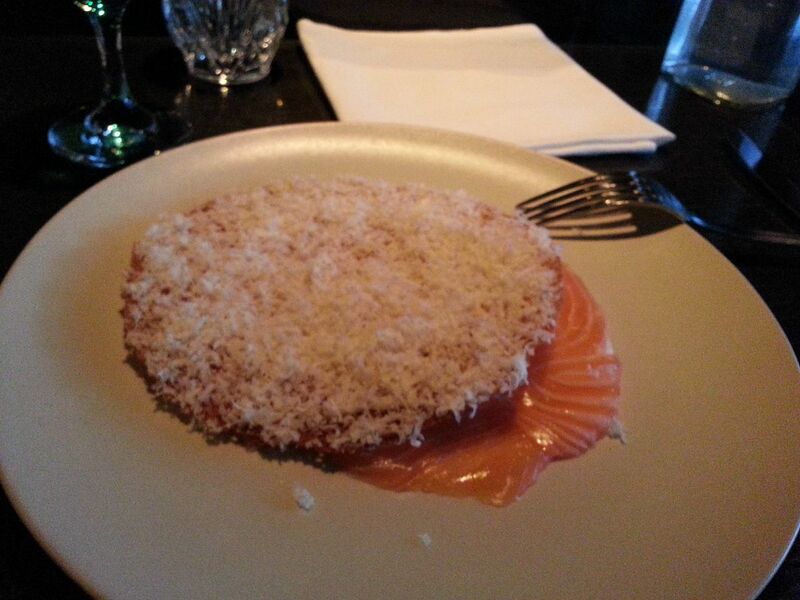 For example, dishes like poached egg topped with raw mushroom, mushroom confit and fried chicken skin at Manfreds & Vin or the raw salmon, horseradish crisp with macadamia nuts at Geist, which combine different flavours and textures in a single plate. Sometimes it works, sometimes it doesn't, but who cares as long as they're having a crack. As has become quite common, the food doesn't necessarily follow the traditional three-course structure. Instead, a mix and match of small, medium and large dishes to be shared (or not) as well as tasting menus where you leave it to the chef are all the rage. Oh, and another thing I like about eating in Copenhagen is that many restaurants offer you a glimpse of the action with a ringside seat peering into an open kitchen. I know these attributes don't necessarily make a restaurant 'Copenhagen-style', but the thing with a smaller city is that a 'scene' can develop in a way it can't in London or New York, where there are many different culinary voices wanting their song to be heard. That said, in parallel to developments in Denmark, restaurants with a similar ethos are popping up everywhere. 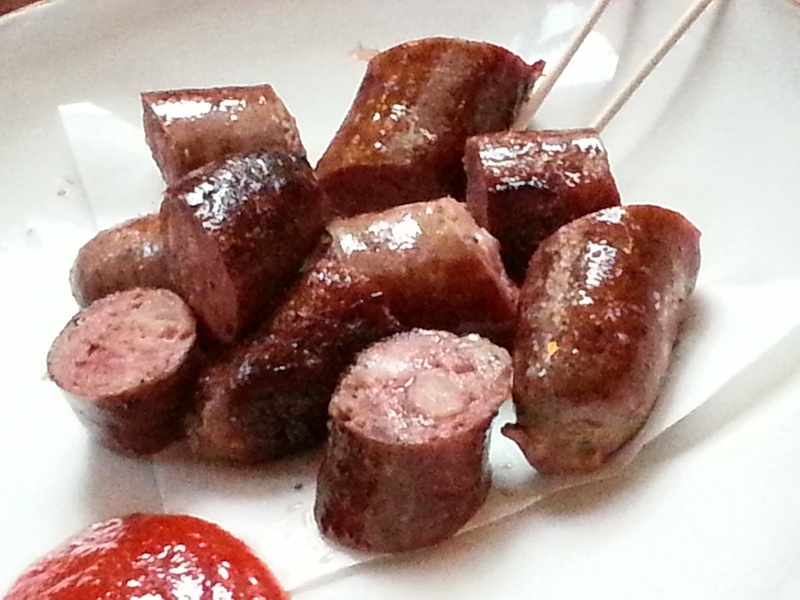 For example, The Clove Club in London is wowing punters with its no-choice tasting menu (I want those wood pigeon sausages!). Although derided by bitter, cynical hacks as food-for-Instagram or cuisine du blogeur, I really hope this is one trend that is here to stay. To those of you who aren't noodle geeks, Ippudo (一風堂) is a Japanese restaurant group famed for its ramen, in particular its tonkotsu ramen. In recent years it has expanded from its original Fukuoka base to other parts of Japan and beyond. 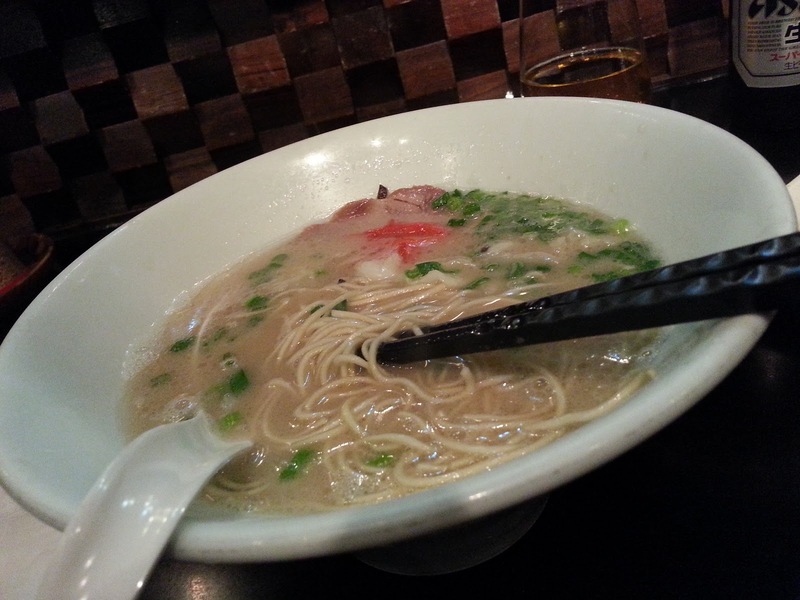 In fact I first heard about Ippudo from rave reviews of its New York outlet. So when I found out there was a branch in Singapore plans were made to go there during my recent trip to the island state. But the thing with renowned restaurants is the weight of expectations. Would Ippudo come up to scratch? I went for the Shiromaru Special (S$23) – a classic Hakata-style tonkotsu ramen featuring cha shu pork, braised pork belly (kakuni), cabbage, spring onions, egg (tamago), and bamboo shoots (menma). First impressions were good; I was asked how I wanted my noodles done (medium) and they did have a nice bite to them. And as is customary, they were the thin noodles that should be served with tonkotsu. 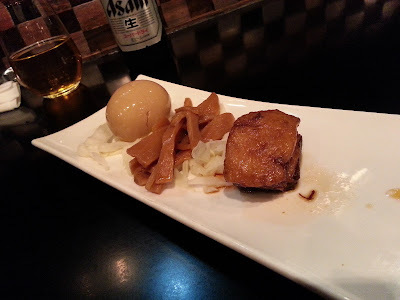 The toppings were by and large of decent quality – in particular the pork belly. However, there wasn't much of the cha shu and the egg (oddly served whole) was decidedly weird with the white not entirely cooked through in some places despite the yolk not being runny. I could forgive all of the above shortcomings if the tonkotsu broth was top class. It wasn't. Being in Asia, I expected the proper primeval, slightly disturbing whiff of molten collagen in a milky white broth. So I was disappointed when that wasn't the case. It was far from being a bad broth; it just wasn't as good as I thought it should be. Onto the sides and I went for a pork bun and a shrimp bun. 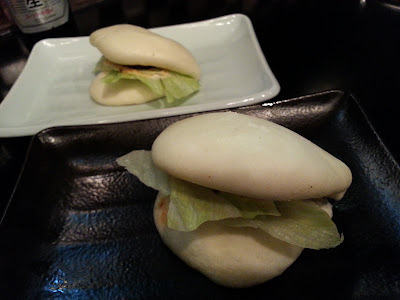 The actual steamed buns were of the finest quality, but the bun-to-filling ratio was all wrong. The respective fillings consisted of a tiny slice of pork belly and a solo breaded shrimp reminiscent of something found in a supermarket freezer cabinet. My overriding memory was just how much bloody lettuce there was in each bun. I guess I can't grumble too much, as the buns cost a mere S$3 each, but I will. To be fair to Ipuddo, perhaps I was all-noodled out following the noodle crawl I had embarked on earlier that day. Or maybe I ordered the wrong things. Some mentioned on twitter that I should have ordered the Akamaru, which comes with a miso paste-bomb and black sesame oil. That's all well and good, but the underlying tonkotsu soup base would have been the same as the Shiromaru I ordered. I had hoped Ippudo would be to ramen what Din Tai Fung is to xiao long bao (I wished I had gone to Din Tai Fung, as there were a couple of branches nearby). It wasn't. There wasn't that much wrong with my food, it's just that Ippudo promised so much more. That's the problem with expectations.